There were a bunch of Smacks around KC in the 60's -70's. 95th & Mission in Prairie Village, the place started off as something else, ?? House? I don't remember what, and Smacks moved in. I think they had one on Metcalf too, I remember a Red Barn on Metcalf. Yep, you're right about the spelling, nice to see Smaky again. But there was also a Red Barn Hamburger joint, I'm thinking around 80th & Metcalf or so, metal building. well, the Smak's we could ride our bikes to was in Mission. Usually was the location for the Smak's fire engine. Back in the 1960's there was a Red Barn at 61st & Prospect. As a young kid and teen I ate there a lot because I lived on 61st St, one block to the east. Not a bad burger as I recollect. The closest Smak's to my KCK home was in the Indian Springs Shopping Center. We had many a meal there 35 years ago. As I recall, they were absorbed by another chain. Was is Hardee's? Smak's was pretty familiar in the KC area up til the early 80's. On the Kansas side, there was one at about 75th and Metcalf (now a Burger King), one on 95th Street a block or 2 west of Antioch (later a Dairy Queen, now a Blimpies? ), and one in the center of Metcalf South mall (2nd or 3rd floor). There may have been one on Johnson drive in Mission, but I can't recall exactly where that was. I believe there was one in the area of 95th and Mission, but again I can't recall the exact location. Does anyone else remember Wylies? Yeah, I remember Wylies, forget where they were. Seems like they had a big burger like a Whopper? Forgot about the Smaks at Metcalf South too. The 2 Wylies that I remember were: 1 on Sante Fe drive in old Overland Park (now a Taco Bell) and 1 on 87th and Monrovia (also now a Taco Bell). As for Smaks, they had the best fries imo. i ate at smacks alot as a kid. we lived at 95 and antioch then moved to around 95 and mission. my dads store was at ranchmart shopping center. was there alot. The Red Barn in Independence specialized in fried chicken. There have been other threads about the chain at Roadfood. Griff's Burger Bar was similar to Smaks. Sedalia still has one. i've been to griff's in sedalia. also eatin many gobber burgers at the wagonwheel. its sad to see all these places get replaced by nasty ole food chains. the smak's at 95 and mission later became a jack in the box. what about taco via in the ranchmart shopping center. spent my youth eatin there. the one in Mission was at the corner of Martway and Roeland Drive. I worked for Smaks in the late 50s until the mid 60s. They were the corporate owner of Allen's Drive In as well as operating the Smaks franchise. I managed the Allen's Drive In on West 23rd St in Lawrence and the Allen's Drive In on Topeka Boulevard in Topeka at different times. You are right about Smaks being absorbed by another chain. It was McDonalds. In fact the Allen Royal sandwich served at Allen's Drive Ins was the original Big Mac. Two pieces of meat with a slice of bun between. i remember arthur treachers, might have been a drive thru one at 95 and antioch. You're correct. It was out in front of a strip mall on the northwest corner of 95th and Antioch in O.P. They originally had great fish, but it suffered later on when they went to using lower quality fish. In fact, the Smak's was right across 95th street from the Arthur Treachers. That Smak's later became a Dairy Queen and now I think it is a Blimpie's sandwich place. we lived just south 2 blocks back then. if i remember right, burgers at smak's were like 19 cents back then. The 2 Smaks I remember were at Ward Parkway downstairs by where Dicks is and the other was on 71 highway in Grandview on the Southwest corner, they turned it into a gas station and now its a Walgreens. I loved dressing my burgers at the burger bar at Smak's. I went to the one at one of the malls in the KC area, Possibly oak Park. We had a Griffs in Ottawa, which then became a Dairy Queen Brazier. Doc, I bet the mall Smak's that you remember was at Metcalf South Mall. The Smak's was located on the third floor in the center area, just off in the corner. When Smak's left, it became a Dairy Queen, also. Thanks, collinf, that was probably it. That is where I discovered that I loved putting blue cheese among other things on my burgers. The Cryan' Shames opened Metcalf South in 1966. I can remember how far away it seemed, right across the street from the French Market. The Smak's at 95th and Mission was preceded by Hasty House, a rather short lived hamburger joint with a special sauce as I recall. The sauce was not my favorite by a long shot as a kid of 8 or 9 years old in 1959-1960.
kennyb what store did you dad own? I remember Chutes, but I don't remember if I ever ate there. I don't think they were around long. Didn't all the Smaks become Chutes, or am I remembering incorrectly? Chutes only lasted about 1 year: came in '77, gone in '78. I always wondered how they could have gotten away with an insignia design that was an exact copy of the Atari company. 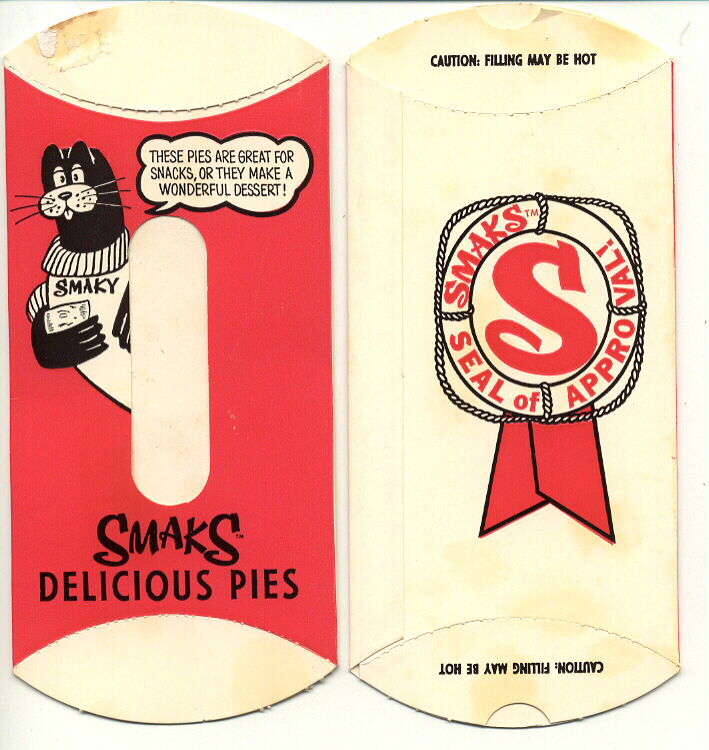 Smaks was gone by the early to mid 1980's. Their locations were taken over by various other fast-food businesses: Dairy Queen, Arby's, and Burger King from the ones that were around my neck of the woods. All these memories are making me hungry! We frequented Smak's on Wornell Road in the Waldo area when I was a young girl. I loved their fried chicken. Didn't they have a character called "Shmoo" or something like that? Allen's Drive In - no where better in the world for pork tenderloin sandwiches and hot fudge sundaes after church. Does anyone remember a little drive-in place called "Mark 90"? I went to Boone Elementary School and it was across the street from there on Wornall Road. I believe it was named for the Lucky Strike Lanes bowling alley just behind it. It was one of those places where you could eat for $0.30, 19 cents for the burger, a dime for the coke, and a penny for a piece of bubble gum afterwards. Those places don't exist anymore! When I take my family back home now, we go to Smoke Stack BBQ, I believe at 89th and Wornall. Best BBQ in the world, bar none (imho). Love the Red Barn, too, for their kids chicken dinner that came in a red shaped box. Any memories of these places, I would love to hear. I love and miss KC. Go Chiefs! Now this brings back some memories. I started working at the Allens Drive In in Topeka in Jan 1968. Was stationed at Forbes AFB at the time. After my discharge in July of that year went to work at the SMAKS at, I thing, 1410 N. Burlington in KC North. Across the ASB bridge. Worked there untill November of 68.